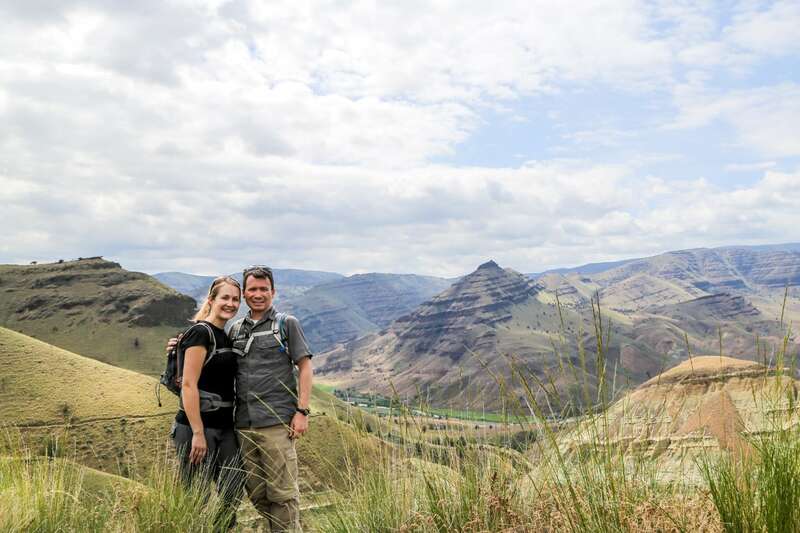 Lori and I took an extended Memorial Day weekend to explore the lesser-known, but equally amazing eastern portion of our home state of Oregon. We covered 1,200 miles over five days, sticking mostly to back roads, which got us away from the crowds and out into some of the most stunning landscape we’ve seen in a while. 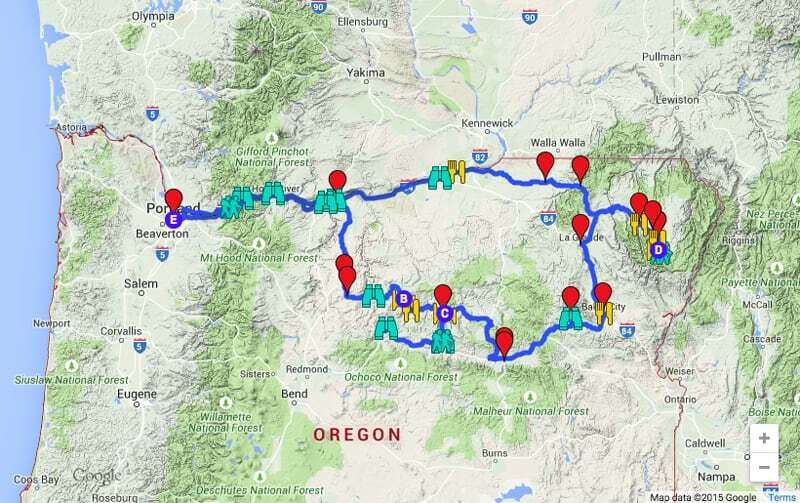 Our route is outlined above. 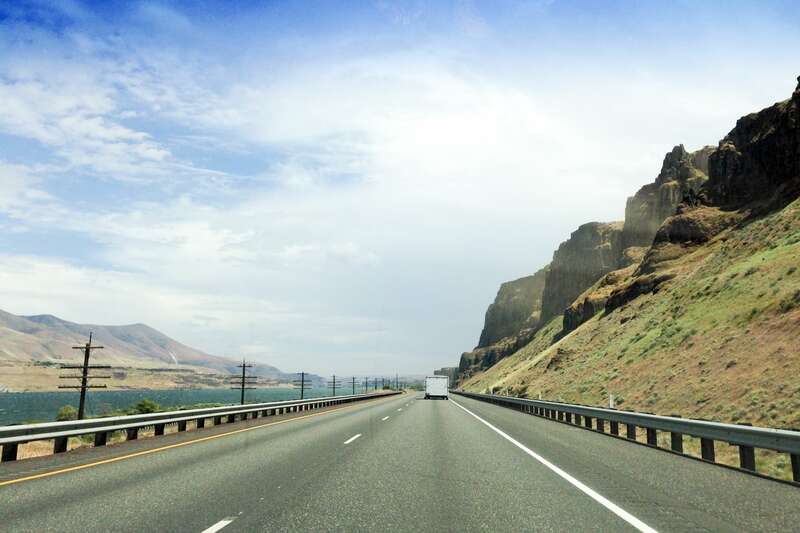 We left Portland Friday morning and headed east on I-84 towards The Dalles. Traffic cleared out after Hood River and we mostly had the interstate to ourselves. 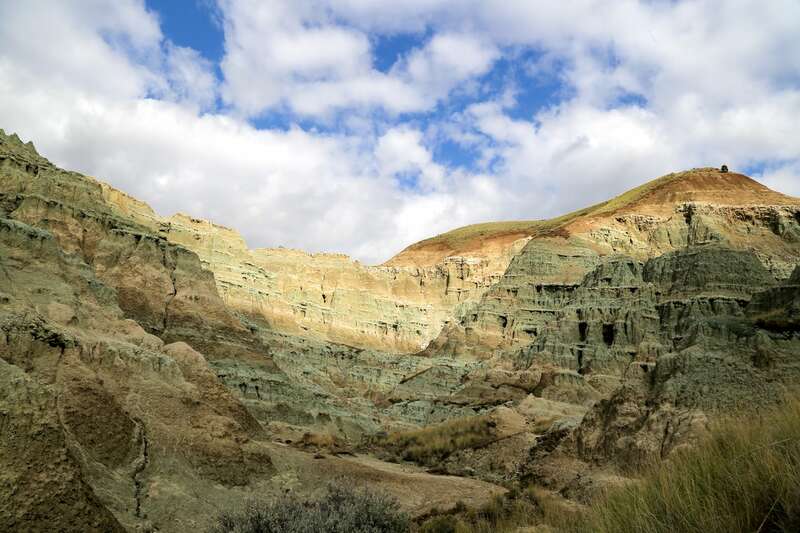 The plan for the weekend was to spend two nights around the John Day Fossil Beds National Monument, and two nights in and around Wallowa Lake State Park, widely considered the ‘Alps of Oregon’ in the far northeastern portion of the state. 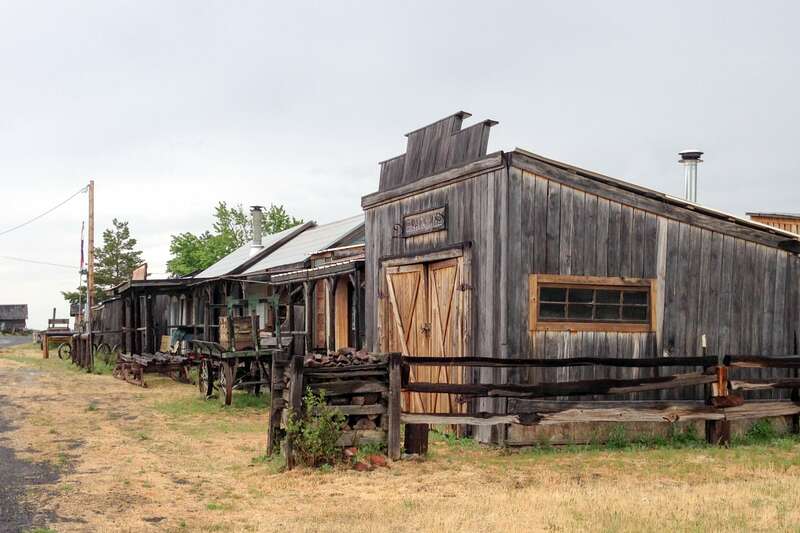 At Biggs Junction, we took US-97 south as far as the “ghost town” of Shaniko, which isn’t so much a ghost town as a sparsely populated rural community with a strip of abandoned old-west buildings. Lori’s dad had driven these roads a number of times and recommended a number of things to do, including walking around Shaniko and stopping at the ice cream parlor. 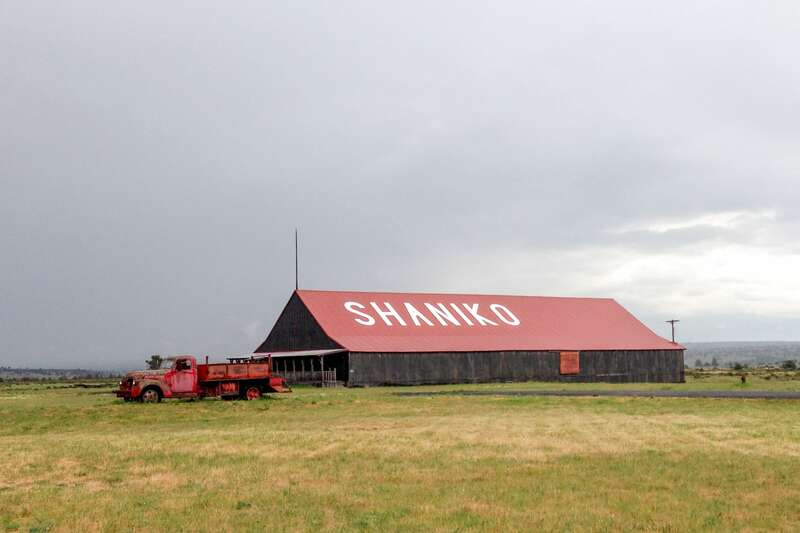 However, by the time we reached Shaniko, there was a steady rain and not much going on, so we decided to keep movin’. 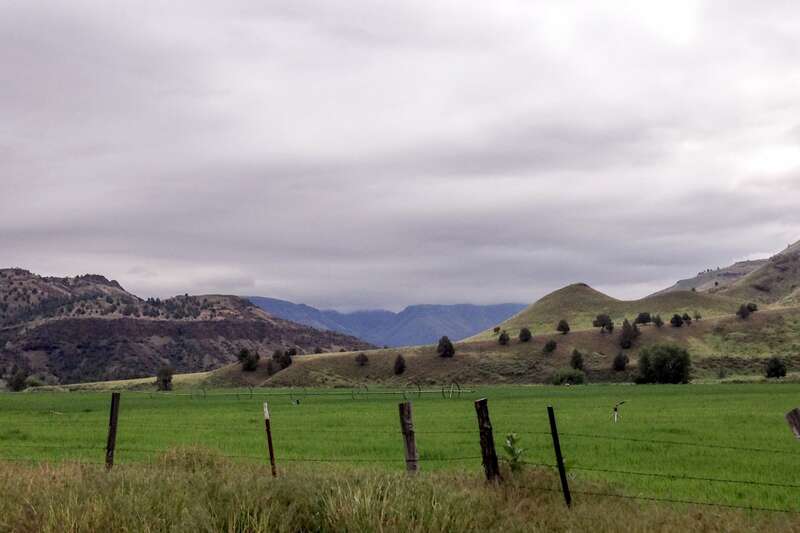 While Lori had traced this route as a child one summer, neither of us had spent much time in this portion of the state prior to our trip, which was part of the allure. 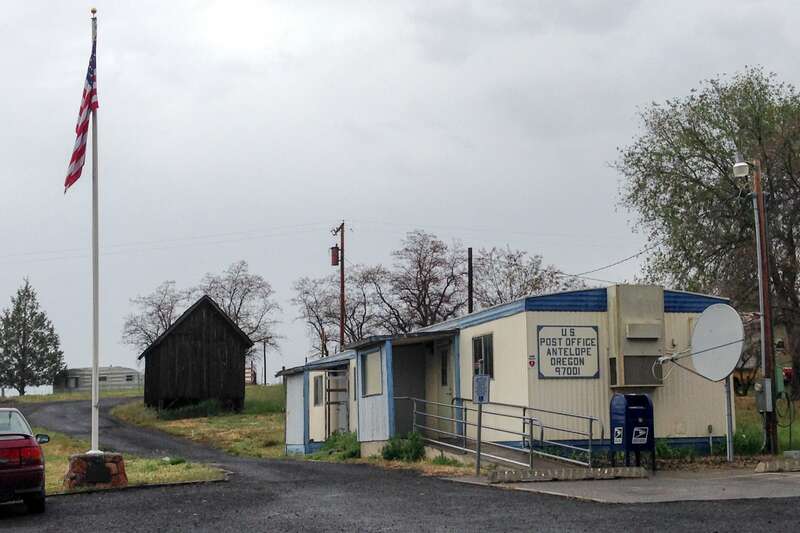 The impression we had of Central and Eastern Oregon was one of high desert and dry, arid landscape. Yet, much of our ride was defined by rolling green hills and an abundance of fir trees. 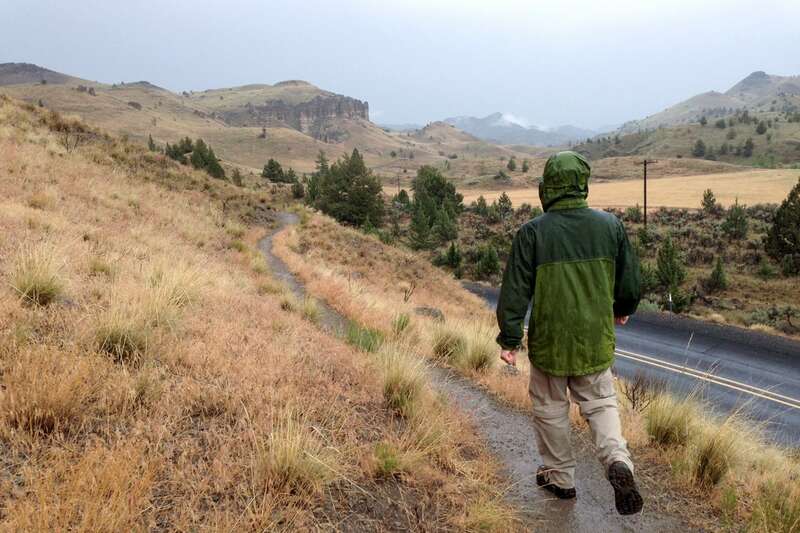 It also rained pretty steadily for the first 24 hours of our trip, which was definitely unexpected, considering that the average annual rainfall in these parts closely compares to Tucson, Arizona (about a third of Portland’s 35 inches per year). The locals we talked to agreed that it was definitely out of the ordinary, but very much needed. 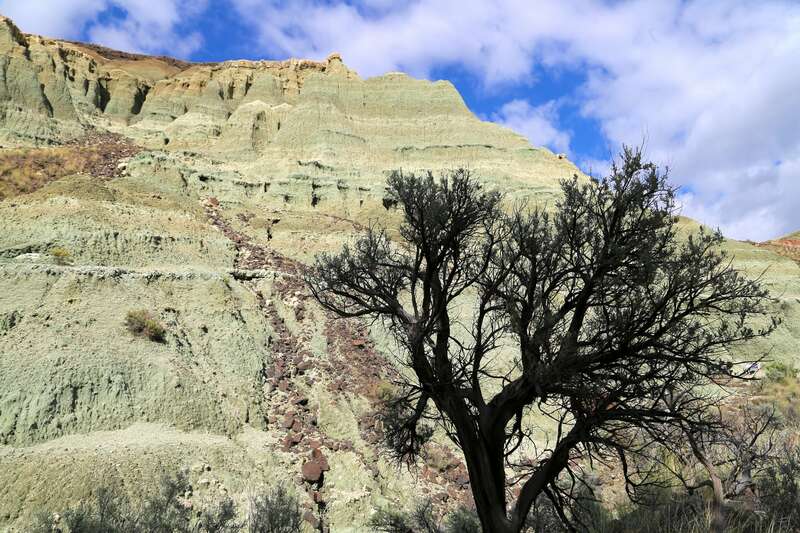 Just our luck on our first big camping weekend since returning to the U.S.
John Day Fossil Beds National Monument is known for its well-preserved layers of fossilized plants and animals dating to between 45 and 5 million years ago. 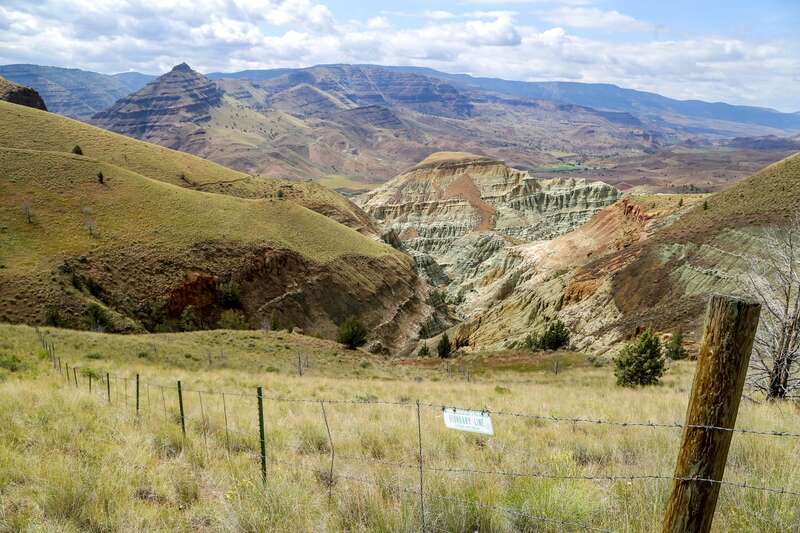 There are three primary sites (Sheep Rock, Painted Hills, and Clarno) spread out over several hundred square miles of Central/Eastern Oregon and averaging about 2,200 feet in elevation. 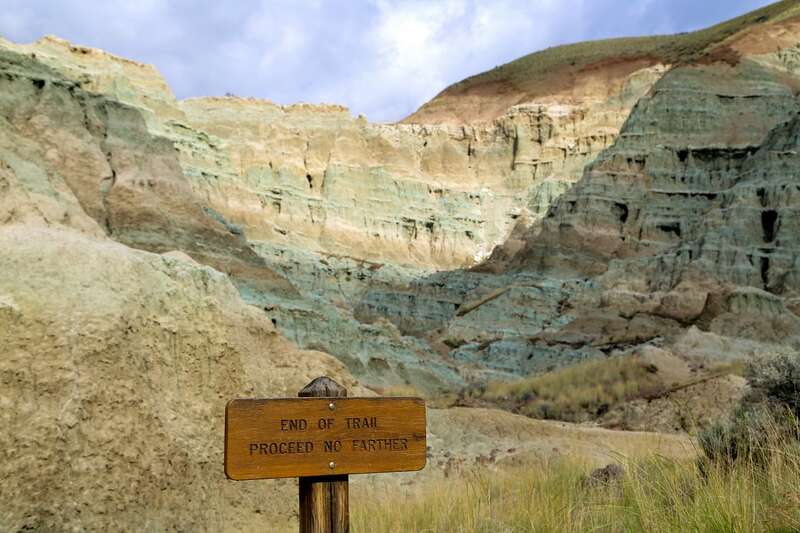 Unlike other sites in the National Parks system, there is no fee to visit the John Day Fossil Beds. Our first stop in the National Monument, was the Clarno Unit. Of the three primary sites, it was the one we were least excited about. 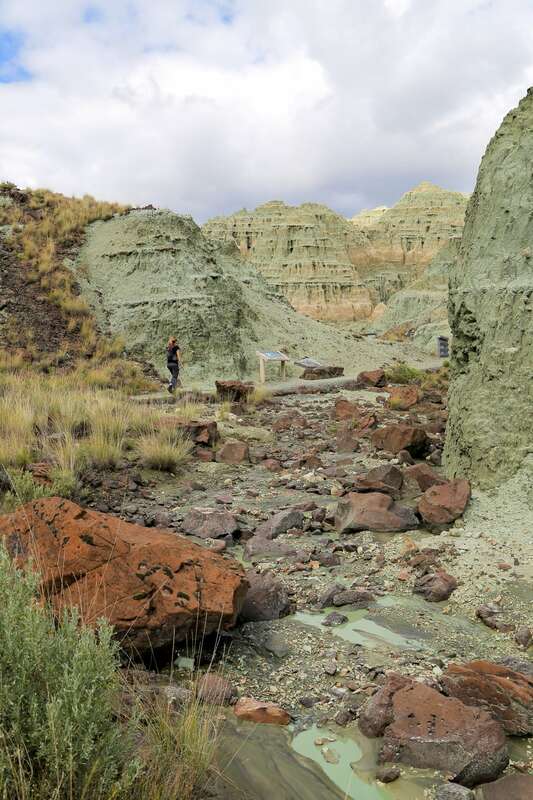 We had read, however, that it had a good system of trails which took you past fossilized remains and interesting rock formations. We lasted about 15 minutes on the trail before deciding the hike in the driving rain just wasn’t worth it and headed onward to set up camp. On our first night of camping, we stayed at Shelton Wayside County Park, about 10 miles up the road from the tiny town (population: 2) of Service Creek. 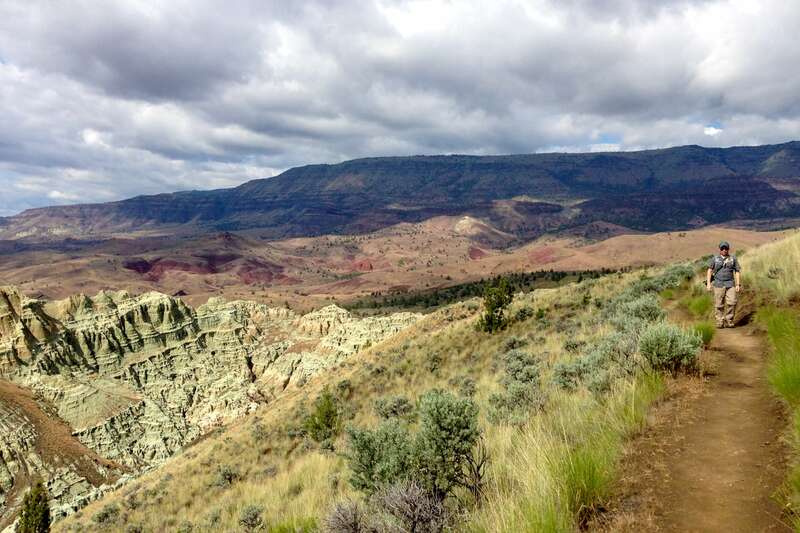 At the time of writing, there are no camping opportunities within the National Monument sites, themselves. 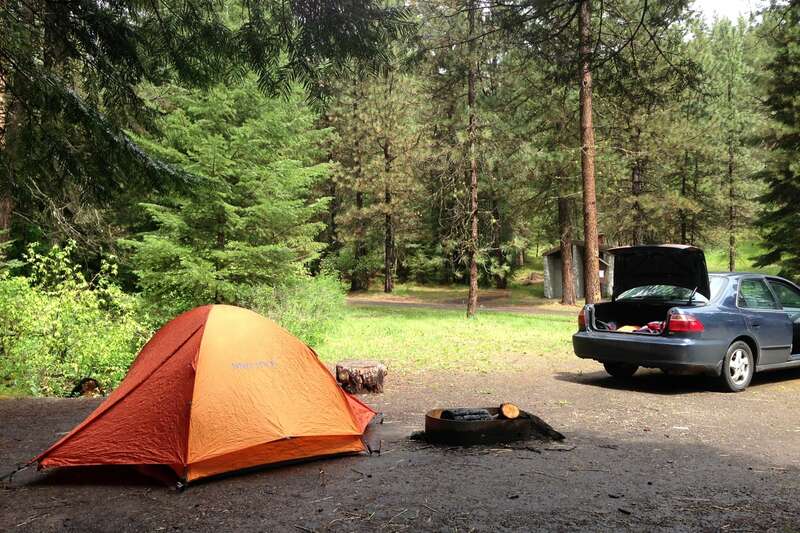 There are, however, about half a dozen County, State, BLM and private campgrounds spread throughout the area. 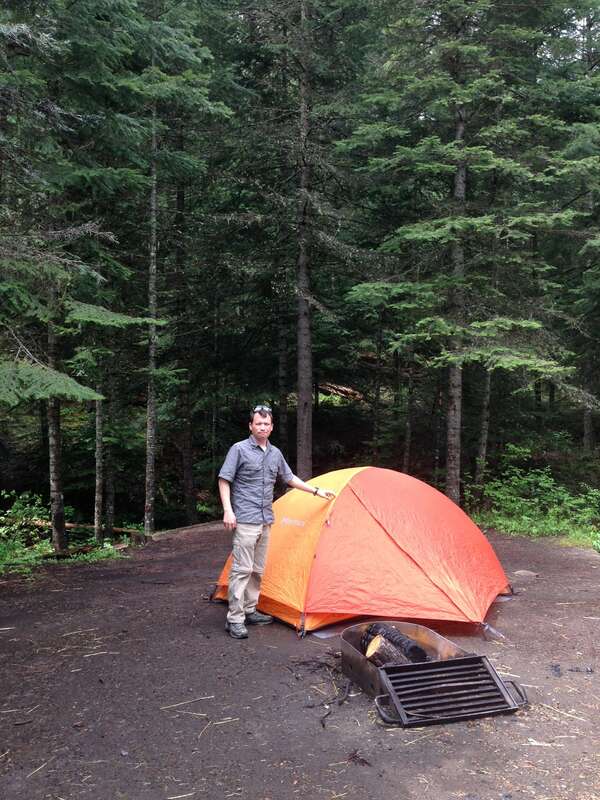 At 3,400 feet, Shelton Wayside was lush and green, feeling more like a western Oregon campground than anything we expected to find east of the Cascades. We were concerned that we might have trouble finding a campsite on the Friday afternoon of Memorial Day weekend, but it really was not a problem at all. 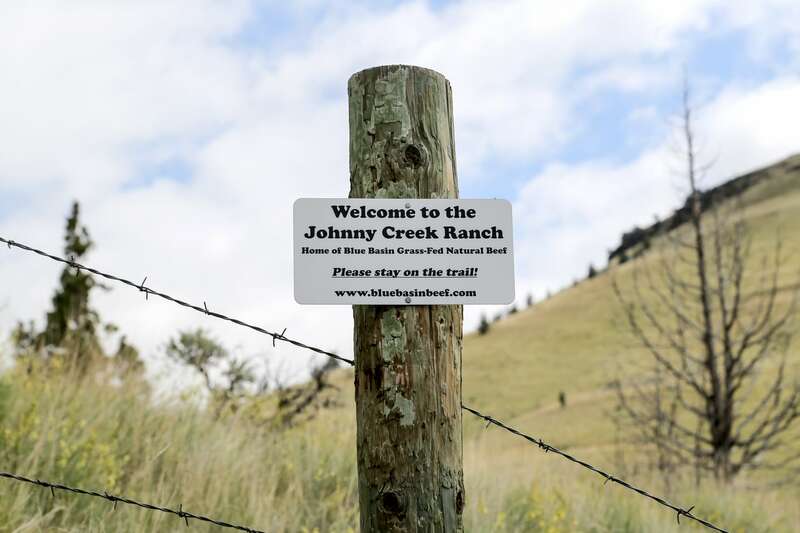 With exception of a couple BLM-managed campgrounds around Service Creek, most had more than enough vacancy. Not knowing this at first, we decided to camp at Shelton Wayside because it seemed like the easiest option with 40 sites at $10/night (and $5 for each subsequent night). Services were limited, but sufficient (vault toilets, fire ring, potable water taps and dumpsters), and spread out along a rushing creek. The rains paused just long enough to set up camp, take a short hike and boil up some franks, before the storms returned without a noticeable break for the next 12 hours. We awoke to rain, but took advantage of a sun break to get a start on the day. 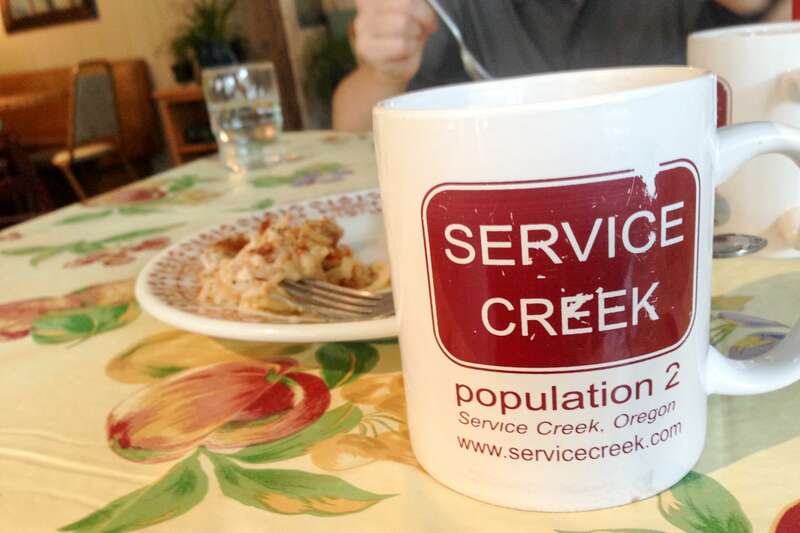 We grabbed some breakfast at the cafe in Service Creek before heading farther down the hill to the Sheep Rock Unit of fossil beds. 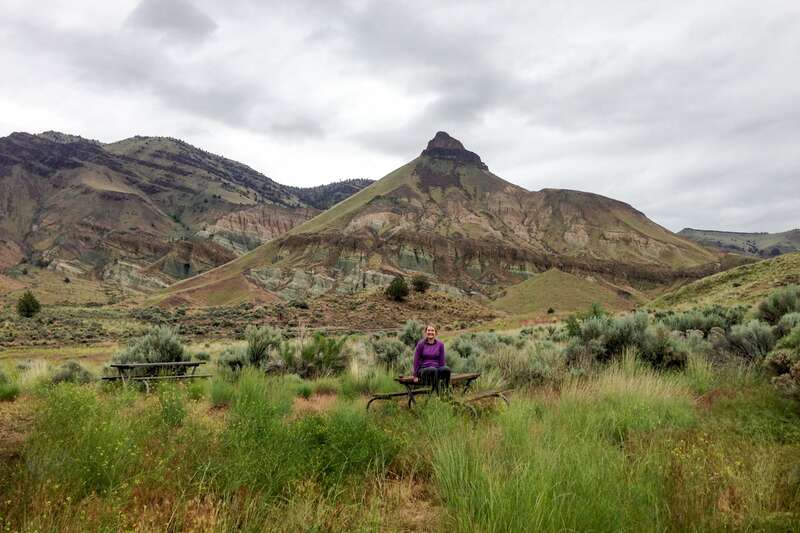 Along the way, we stopped to peruse a couple of BLM campgrounds closer to the fossil beds and in a more arid part of the region, and found one that we really liked: Big Bend Campground. So…we drove back up the mountain, packed up our tent at Shelton Wayside (before the rains began again) and returned to Big Bend, where it was what still bone dry. When we were finally settled in our new digs, we made our way to the Visitor’s Center to gain a little bit of insight into what we would be looking at all day, fixed some peanut butter and jelly sandwiches across the street at the James Cant ranch house, and headed on to see some fossils. 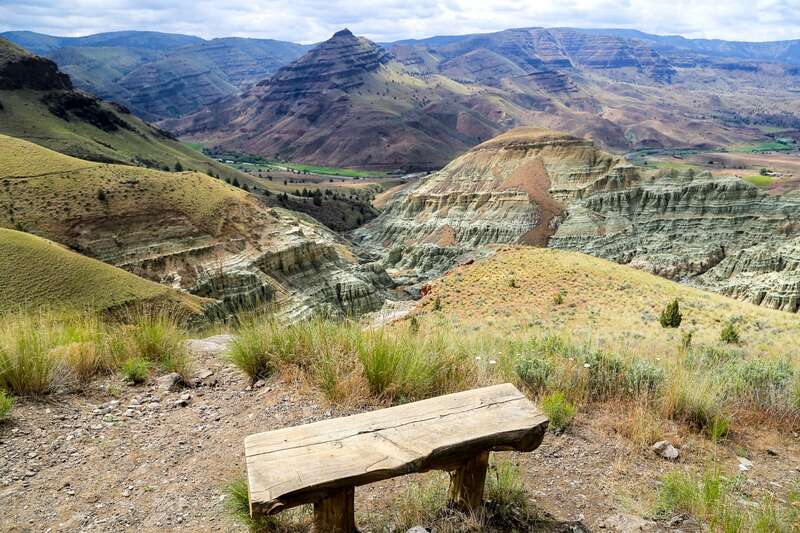 Honestly, you don’t see a lot of fossils at the John Day Fossil Beds…it’s not like they are just laying around by the hundreds. 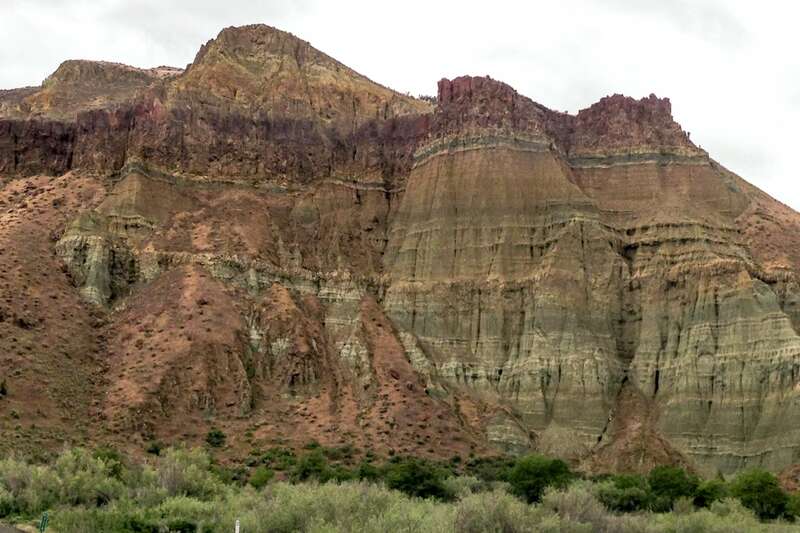 For us, the coolest thing about the sites we visited was the otherworldly scenery that offered the unique opportunity to view several million years of geological history in the sides of mountains. 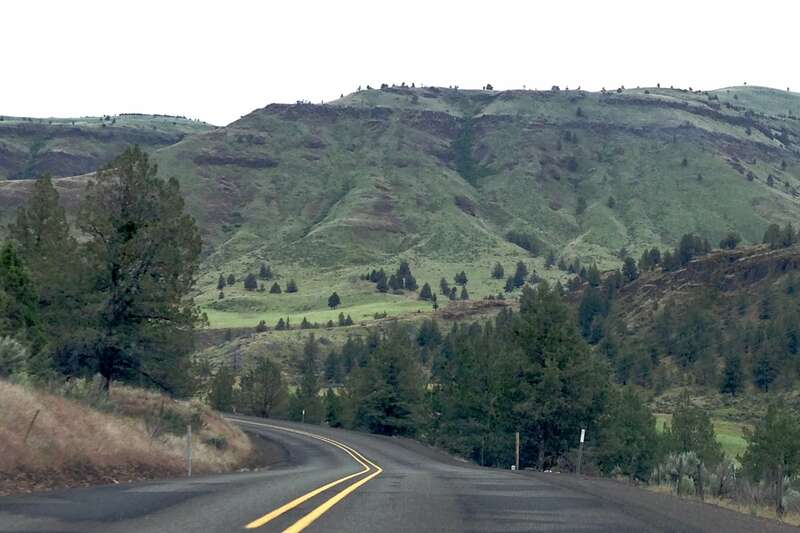 Believe it or not, nearly all of Oregon once resembled the jungles of Panama…millions of years ago. 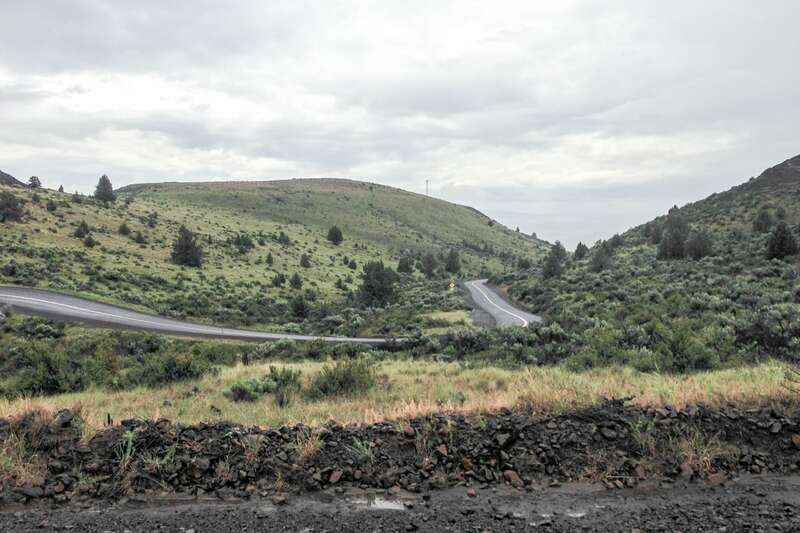 Oregon was believed to be a flat, tropical Eden, brimming with a variety of prehistoric plant and animal life. That all changed when the earth opened and molten lava flows devoured the tropical landscape. 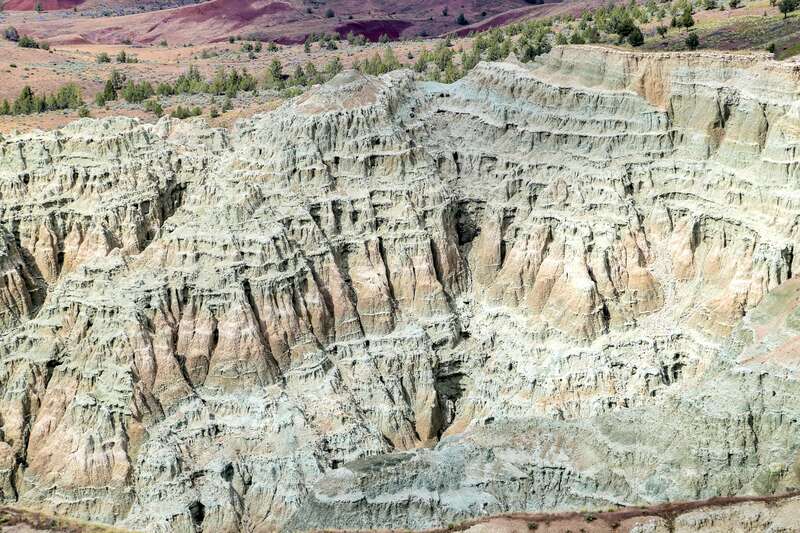 Over the next several million years, volcanic and tectonic activity formed the precursor to today’s rugged mountain ranges. 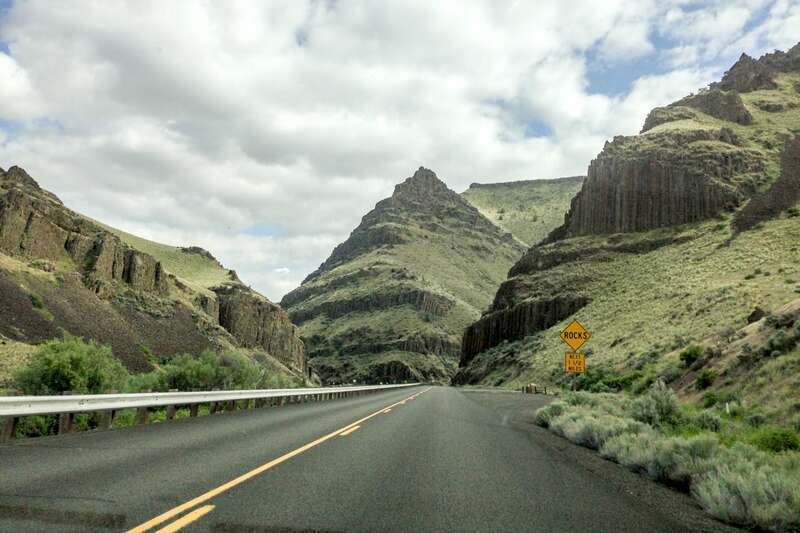 In later years, erosion and glacial activity sculpted the Eastern Oregon landscape into what we see today. 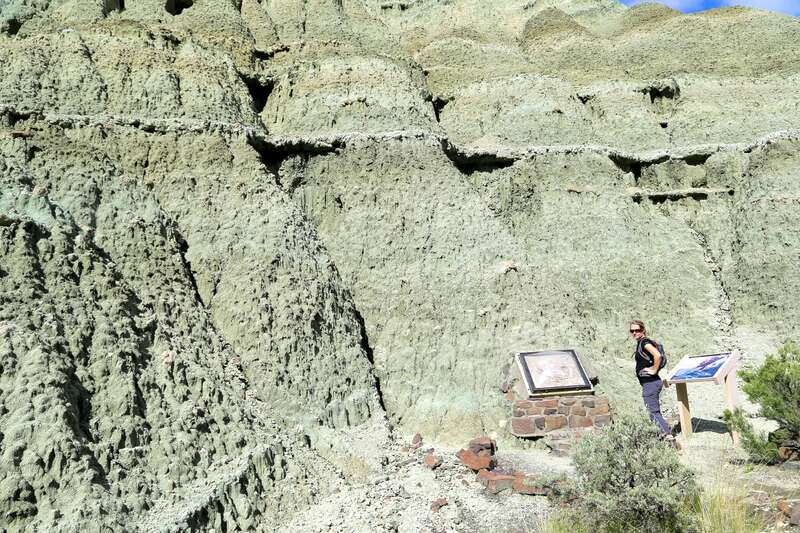 One of the most popular places to visit within the Sheep Rock Unit is Blue Basin, which offers two hikes that are definitely worth doing. 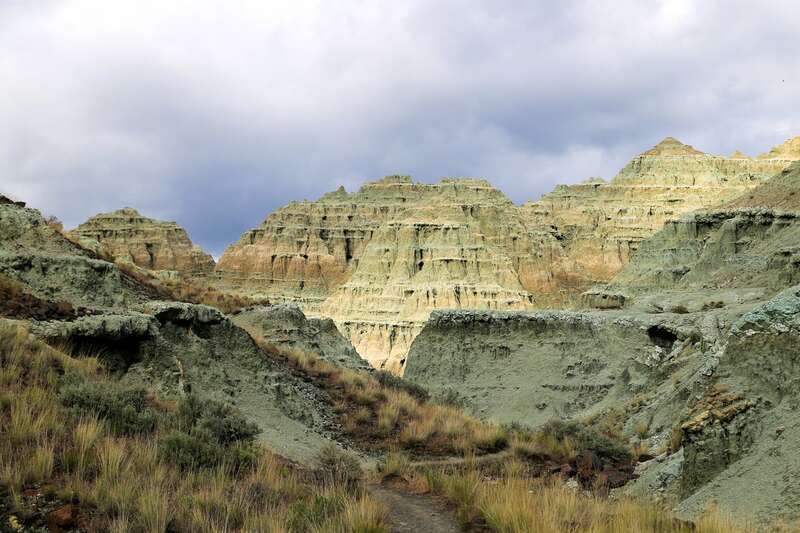 The three-mile Blue Basin Overlook loop ascends high above the fossil beds and offers incredible views of the valley below. The bench, above, marks the halfway point, and quite possibly the best view in the area. A gorgeous Saturday afternoon on Memorial Day weekend at one of the most popular hikes in the National Monument, and not a soul around. Can’t beat that! 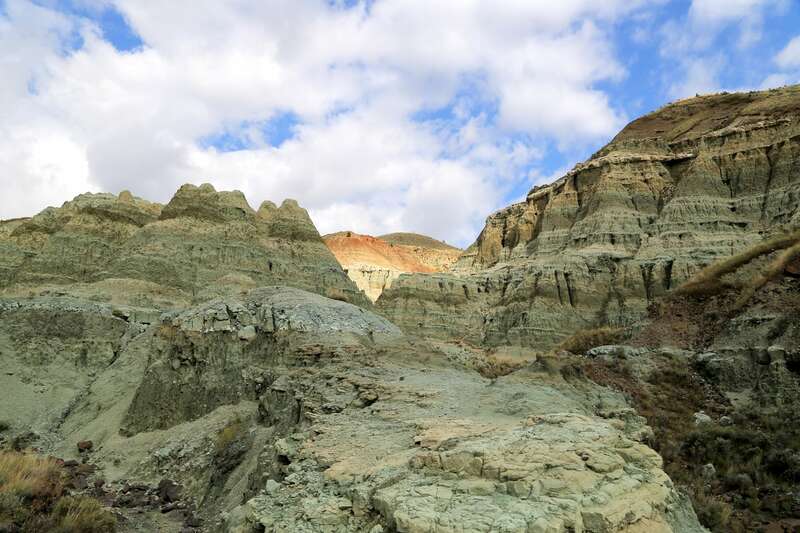 The 0.8 mile ‘Island in Time’ trail doesn’t offer any sweeping views, but gives a very different perspective on Blue Basin as it winds through the heart of the fossil beds of the ravine. 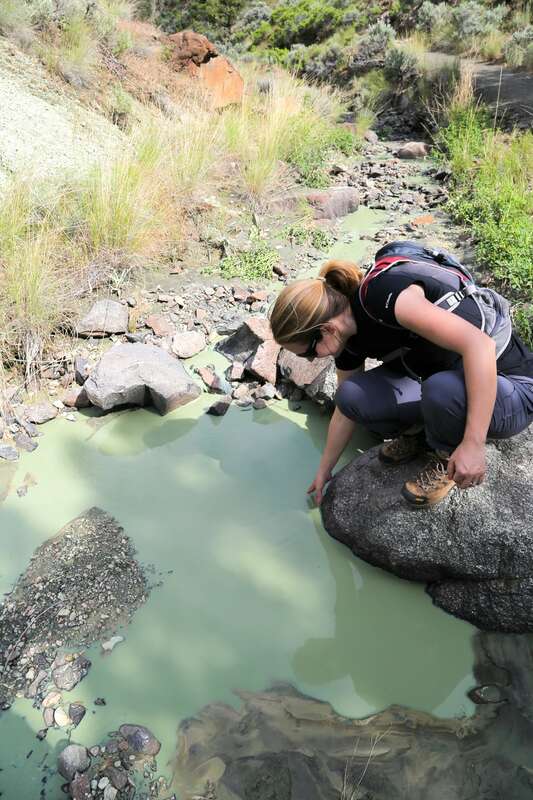 Lori was quite taken by the slate-green water flowing through the canyon. 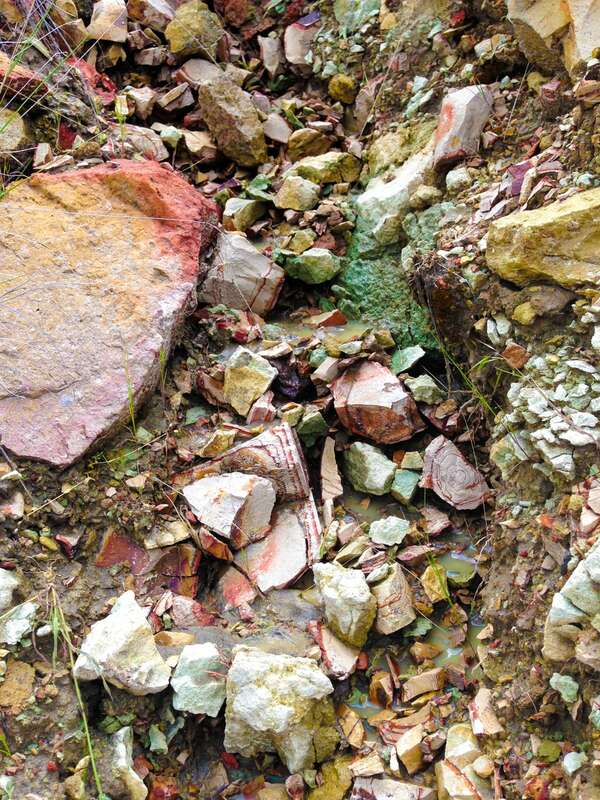 The most distinctive feature of the ravine is the green clay mountainsides completely enveloping the trail.